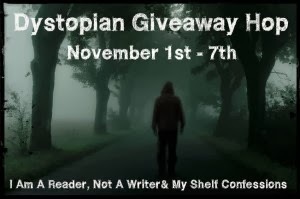 Welcome to the Dystopian Giveaway Blog Hop hosted by My Shelf Confessions and I Am A Reader, Not a Writer. There are over eighty blogs participating and this hop runs through midnight on November 7th. 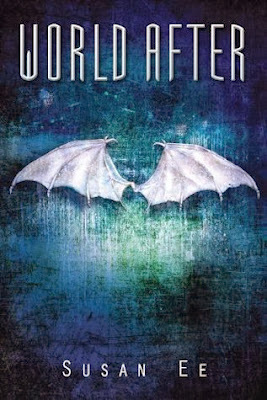 One pre-ordered eBook or paperback copy of World After, the sequel to Angelfall by Susan Ee. For our international participants, an Amazon gift card can be substituted in the amount of the prize. I do! I love reading dystopian novels- they are fascinating with strong characters! I do! Not sure exactly why, I've loved them since I first read The Giver. I love dystopia, the stories are exciting and tell of different worlds. I do! I love dystopians a apocalyptic/post-apocalyptic books. I'm not sure why i love them. The world is set for life-and-death? Lots of action? I do and mostly I love them (except when they've been done before and it feels like you're reading the same book). And I guess because their different and I like to see how far the author's imagination can go! I like to read dystopians because I'm curious to see the kind of future that the author imagines! Some of them are so creative! Thanks for this amazing giveaway - I would love to win! I'm new to the dystopian genre and so far, I like it a lot. It is very interesting to know how an author sees the future. Thank you for this giveaway! :) - cindy c.
I do, although it isn't necessarily my first pick. Still, I find the future worlds the awesome strength of the characters that's necessary to survive fascinating. I read dystopian books because I find the characters and world building fascinating. Thanks for the great giveaway! It's a genre I honestly am quite new to. I am quite curious. I usually prefer romantic/contemporary stories. But, it's fun to change things up. I do. I love how they are so exciting to read! I love to read post apocalyptic and dystopian books. I liked to see how the author will create the world and how the main characters will survive it. I love dystopian books - I find them fascinating. I love Dystopian books! The strong characters, world building and suspense, creativity of survival is great! Thanks! Yeah! It makes me thankful that I don't live in those worlds! I do read them occasionally becasue I love the numb feeling Dystopians give me, thanks for the giveaway! I've never read one before. I would love to see what they're all about. Yes, I love dystopian books. They're all about the future, and I find it fascinating. yes, i love dystopian books. it's so fun to read because we get to immerse ourselves in worlds that act in a particular way. Oh yeah! Because they are awesome! I love reading about the different worlds authors come up with, they usually have tough characters and action! Thanks for the chance! Yes, I do read dystopians. If the writing is good it and there is a twist in the reasoning behind the world they can be pretty awesome. I just finished with The Hallowed Ones and thought it was pretty good. I do, if the storyline is compelling and it's not too depressing. Thanks for the giveaway! I read them, although I like those that fall more within the category of urban fantasy. Many of the traditional dystopians seem too formulaic. They are so very predictable, unless there is something of the supernatural/paranormal element involved. Thanks for the great giveaway.